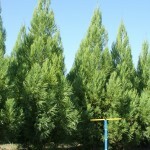 Fast growing pyramidal tree with rich bright green foliage that turns bronze-green in the winter. The short needles are arranged in a spiral manner, creating a "foxtail" look. Useful for screening or a tall hedge. It prefers full sun and a well-drained soil. Do not allow to dry out. The species is a timber tree in its native habitat in Japan and China.